Akhilesh and Dimple are learnt to be planning to construct a hotel. LUCKNOW: Former Uttar Pradesh Chief Minister Akhilesh Yadav and his MP wife Dimple Yadav will soon be entering the hospitality industry as entrepreneurs? So it seems, as both have applied to the Lucknow Development Authority (LDA) for approval of map for their proposed hotel, an official said on Wednesday. His father and family patriarch Mulayam Singh Yadav has also applied for permission to open up a library on the posh Vikramaditya Marg here, a stone's throw from their erstwhile residences, which they vacated following an order from the Supreme Court. An LDA official said that they were in receipt of the two applications and that they would act in accordance with law. Akhilesh and Dimple, who is a Lok Sabha MP from Kannauj, are learnt to be planning to construct a hotel by the name of "Hibiscus Heritage" on 1-A, Vikramaditya Marg here. The couple had purchased the 23,872 square feet plot in 2005 at a cost of Rs 39 lakh from one Jwala Ramnath. The property is now worth crores. The map section of the Authority had initially raised some objections which were clarified and the application was submitted again. "The LDA has now sought no-objection certificates (NOCs) from the Chief Town Planner, Lucknow Municipal Corporation, waterworks, state Estate Officer and the Director General (Security), among others...," an official told IANS. The plot falls comes in a high-security zone where buildings cannot be more than seven meters and hence all these NOCs are required. The map application for the hotel and the library submitted before the LDA are of two-storey buildings. 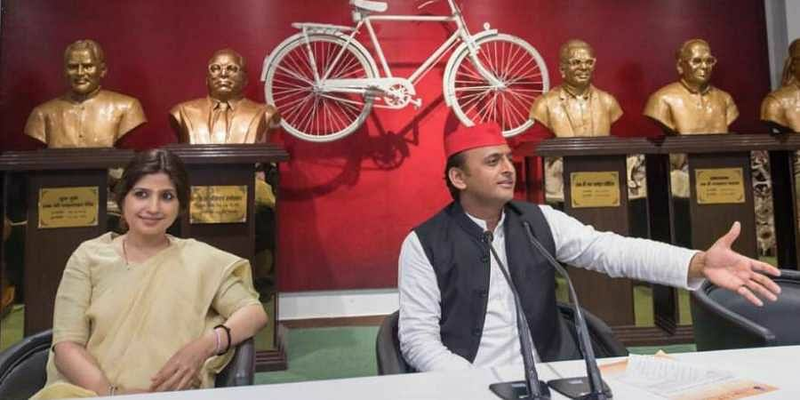 Samajwadi Party leaders have, however, claimed that after the construction, the Yadavs will stay at this hotel, which in fact is a "guest house".